This LG 49" Commercial LED TV is in great working condition. LG LED TV, Remote control, Stand base, and AC power cord. The black LG 49LX341C 49"-Class Full HD Commercial LED TV is designed for use in professional and hospitality environments. This model has a 49"-class edge-lit LED display with a 300 cd/m² brightness output and features a 1920 x 1080 native resolution for viewing detailed high-definition content. The 1200:1 contrast ratio showcases this TV's ability to handle light and dark on-screen images. The panel has a 9ms response time to combat image blur and distortion on moving images. 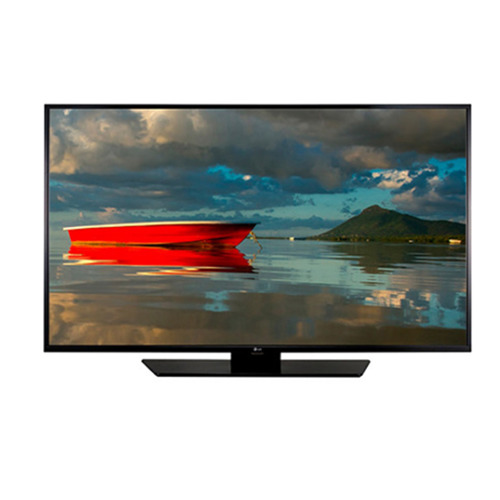 This LG commercial TV features RF antenna, RGB, USB and two HDMI ports for interfacing a variety of video sources. The RF input allows you to receive free over-the-air high-definition content. This model also has dual 10W speakers built-in for producing stereo sound. A digital optical port is also available for outputting audio to an external audio system. As an ENERGY STAR-qualified TV, this model was designed with efficient power management in mind.